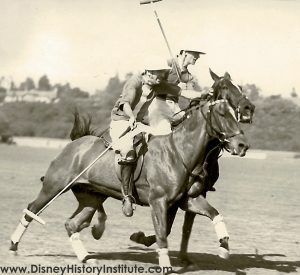 Walt Disney the creator of Mickey Mouse, Donald Duck and many other characters from our childhoods was, for a time in his life, utterly enthralled by the sport of polo. Though not a particularly sporty or athletic child, he came to polo later in life and thoroughly fell in love with the game. Walt Disney suffered a lot of stress in his life, from his work, as he was a high achiever, a fierce innovator and quite frankly somewhat of a micro-manager, and from his home life, as his wife tragically suffered two consecutive miscarriages. His doctor advised him to take up exercise to help reduce his stress, and it was’t long before the sport of polo was doing just this. Having first tried boxing, wrestling and golf, to no avail, Walt, with a love of horses, joined a local riding club and began horse riding. At this time, during the 1930s, polo was a very popular team game, and especially so with Hollywood’s elite. As well as being a competitive and physical sport, the world of polo in Hollywood was also one of social networking, with many of the famous faces of the time present in this sphere, often congregating at the Beverley Hills Polo Lounge. Will Rogers, the highest paid actor at the time, was a big promotor of the sport of polo, and on meeting Walt Disney introduced him to the ‘sport of kings’. With his love of horse riding and want to integrate with the who’s who of Hollywood’s entertainment industry, polo seemed the perfect idea. 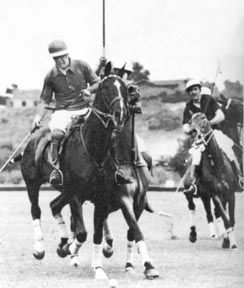 Along with his brother, Roy, and other friends and colleagues, Walt enlisted the help of polo expert Gil Procter for practical lessons and theoretical lectures, as well as studying As To Polo by William Cameron Forbes. As the animator became more engrossed in the sport he even built polo ‘cages’ at his studio and at his home, where he and his companions would practice hitting balls while perched on wooden dummy horses. 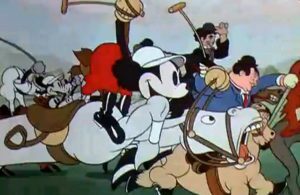 In 1936 a short film by the name of Mickey’s Polo Team was released, involving a polo match played by some of Disney’s most loved characters and some of Hollywood’s most successful stars. Will Rodgers, the man who introduced Walt to the sport, was set to play a big part of the short, but due to his untimely death all references to him were removed, and the full-length feature never materialised. As he improved his game, Walt enlisted three friends to create a polo team, consisting of himself, Robert Presell, James Greeson and Happy Williams. They were known, rather fondly, as the ‘Micky Mouse Team’. They began playing against other novice polo teams, and had some success during their time of the field. With Walt become more and more confident, and wishing to push himself further in the competition, hebegan playing with a professional South American team known as the ‘Argentines’. It was here, however, that Disney suffered a serious incident on the field, causing him to retire from the sport altogether. He was unfortunately hit by a polo ball and knocked off his saddle, and in the process shattered four vertebrae. Perhaps due to seeking help from a chiropractor rather than a doctor, the creative never fully recovered and, sadly, was never to play again.